Deep down, what I really yearn for is somewhere I can sit down and relax, order a reasonably priced beverage and eat good food at my own leisure without feeling over serviced or rushed, which, even with all these new restaurants opening up, I'm finding don't really meet this criteria. 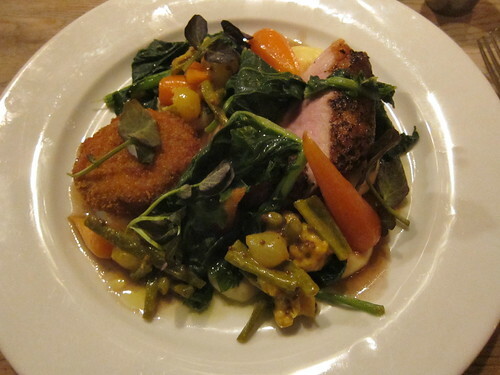 Which was probably one of the reasons I was so bowled over by my visit to the Mall Tavern in Notting Hill. Hidden just off the high street, the Mall Tavern is a gastro pub with a fully functioning utilitarian bar. This isn't a restaurant masquerading as a gastro pub, this is a pub which serves very good food. They have a variety of beers on draught and even stock proper crisps (for proper, read Monster Munch). Add a dart board and a fruit machine and I would happily settle in for a few hours. Round the back of the bar is the restaurant area, and although the tables are more well dressed, the service is still casual yet attentive. Service with a more human touch, which sounds like a ridiculous thing to say in principle, but I still find myself enamoured by the less robotic approach, versus those who have a pre-prepared routine which has been drilled into them. 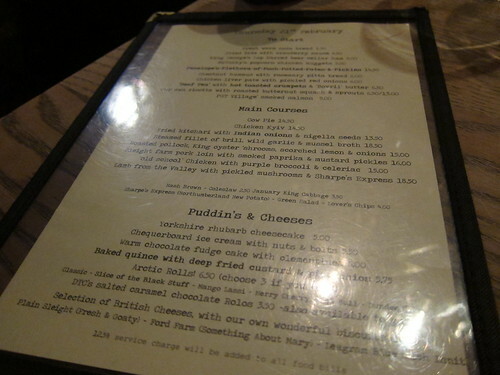 The menu is a rarity, every item is something I would genuinely consider ordering. Sadly, with just two of us, that wasn't going to happen, so we had to settle for a beef tea, some deep fried camembert and popcorn chicken to start. The Beef Tea was an outright winner, not just for being pure crazy, but it fully delivered on flavour too. 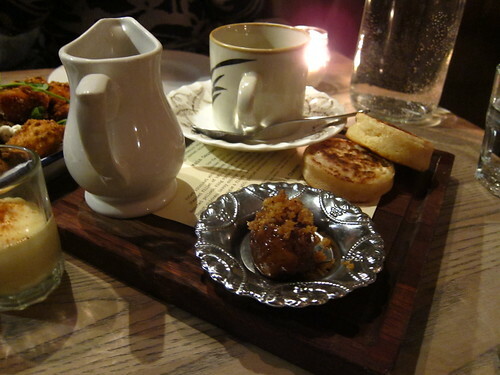 Little scones came with a bovril butter with what I think was a bit of fat speckled on top. Add to that a cup of "beef tea" which was actually a consomme packing in the essence of cow. This was an assault on the eyes, the brain and all my senses. Rock and roll. You can never go wrong with deep fried triangles of oozy cheese served with a sharp, tangy yet sweet cranberry sauce (never). Perfectly executed and greaseless. 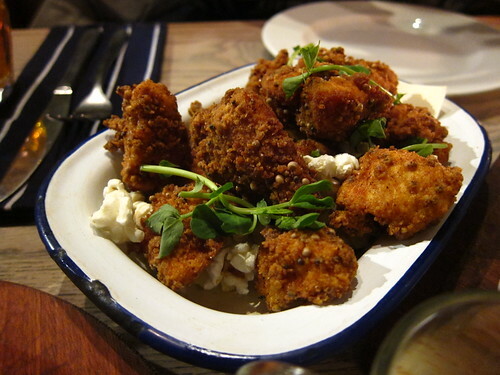 Popcorn chicken were moist morsels of chicken, battered and fried to a crunch, but still managing to retain moisture. I loved the peppery cress and the actual popcorn all thrown together. Witty, but mostly tasty. The mains were an even more difficult decision. With my friend settling on the ever present house chicken kyiv (an all time favourite dish of mine) I plumped for the intriguing pork and pickles dish. After the highs of the starters, it would have been a shame had the mains not stacked up, but I needn't have worried. The pork loin was wonderfully cooked, and those mustard and paprika pickled vegetables cut through the rich pig perfectly. The little crubeen on the side (a little piggy croquette essentially) was packed with fatty pig meat which just coated your mouth in the best possible way. As much as I felt jealous of my friend, I had no arguments with my own dish. As you can probably imagine, we were stuffed by now, but couldn't leave without having a taste of the house arctic rolls. 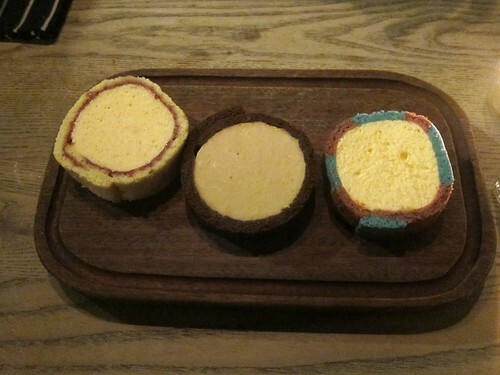 These may seem like an ordinary retro dessert to you, but at the Mall Tavern, they introduce five or six different choices every evening. On this occasion, we settled for one original, one slice of the black stuff and one red bull. The first was jam, sponge and vanilla ice cream, exactly what you would expect and perfectly nice. The second ramps up the crazy a notch and combined a dark malty sponge with Guinness ice cream, which was by far and away the winner. The red bull had to be ordered for the pure novelty, and although it didn't really taste of red bull (it tasted more like bubblegum), it was pretty decent and a great way to end the meal. Yes, as you can tell, I love the Mall Tavern. But why not? 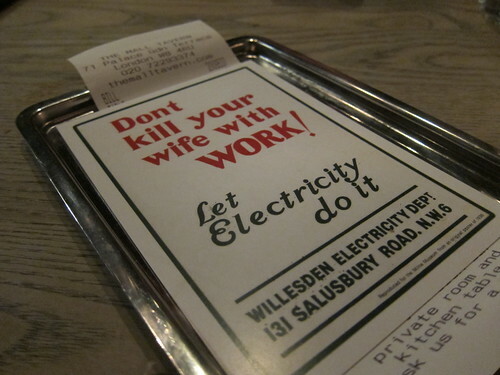 The food doesn't take itself too seriously and doesn't stick to retro or modern, it just sticks to "being great". I loved the inventive little touches to the dishes we tried, and as intimated at the beginning, I think I could have closed my eyes and stuck a pin into each section and still come away with a fantastic meal. I can't recommend it highly enough. There's now The Parlous up this way, offering Jesse's style of cooking, including that popcorn chicken dish, which is so good, and the arctic rolls and homemade rolos! I need to get myself back there soon. Yay! I have fond memories of this meal out :) I had a great time and agree that the beef tea was just incredible! This post reminds me that I used to love brown toast spread with butter and Bovril. My mother also used to feed us bread and dripping in memory of her childhood suppers during the war. Haven't bought any Bovril in years.